A recently published global genome study that used the data-intensive Gordon supercomputer at the San Diego Supercomputer at the University of California, San Diego, has researchers rethinking how avian lineages diverged after the extinction of the dinosaurs. The four-year project, called the Avian Genome Consortium and published in the journal Science, resulted in a new family "tree" for nearly all of the 10,000 species of birds alive today by comparing the entire DNA codes (genomes) of 48 species as varied as parrot, penguin, downy woodpecker, and Anna's hummingbird. The massive undertaking, started in 2011, involved more than 200 researchers at 80 institutions in 20 countries, with related studies involving scientists at more than 140 institutions worldwide. 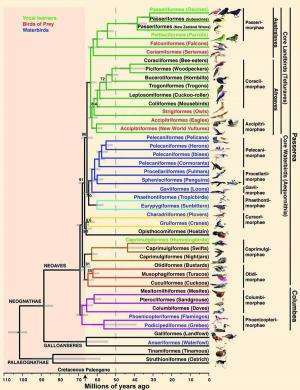 The genome-scale phylogenetic analysis of the 48 bird species considered approximately 14,000 genes. This presented computational challenges not previously encountered by researchers in smaller-scale phylogenomic studies based on analyses of only a few dozen genes. The inclusion of hundreds of times more genetic data per species allowed the researchers to realize the existence of new inter-avian relationships. "Characterization of genomic biodiversity through comprehensive species sampling has the potential to change our understanding of evolution," wrote Erich Jarvis, associate professor of neurobiology at the Howard Hughes Medical Institute at Duke University and the study's principal investigator, in an introduction to a special issue of the journal Science containing eight papers from the study. An additional 20 papers generated by the study were simultaneously published in other journals. "For 50 species, more than 10 to the power of 76 possible trees of life exist. Of these, the right one has to be found," said Andre J. Aberer, with the Heidelberg Institute for Theoretical Studies (HITS), in a news release at the time of the study's publication in Science. "For comparison: About 10 to the power of 78 atoms exist in the universe." Many of the computations were done on SDSC's Gordon supercomputer by Aberer with the assistance of SDSC Distinguished Scientist Wayne Pfeiffer. They ran a new code called ExaML (Exascale Maximum Likelihood) to infer phylogenetic trees using Gordon soon after it debuted in 2012 as one of the 50 most powerful supercomputers in the world. Developed by Alexandros Stamatakis, head of the Scientific Computing Group at HITS, ExaML couples the popular RAxML search algorithm for inference of phylogenetic trees using maximum likelihood with an innovative MPI parallelization approach. This yields improved parallel efficiency, especially on partitioned multi-gene or whole-genome data sets. "I had previously collaborated with Alexis on improving the performance of RAxML," said Pfeiffer. "He described the goals of the Avian Genome Consortium, and we agreed that Gordon, with its just-released fast processors, could provide much of the computer time needed for this ambitious project. In the end, more than 400,000 core hours of computer time were consumed on Gordon." "After doing initial analyses on our institutional cluster, we rapidly realized that comprehensive analysis of the more challenging data sets being considered would require supercomputer resources," said Aberer. "Access to Gordon was thus invaluable for achieving results in a timely manner." In all, high-performance computing (HPC) resources at nine supercomputer centers were used to analyze the complete genomes because of the scope of the undertaking. In addition to Gordon, several other U.S.-based supercomputers that are or have been part of the National Science Foundation's eXtreme Science Engineering and Discovery Environment (XSEDE) were used: Ranger, Lonestar, and Stampede at the Texas Advanced Computing Center (TACC) at the University of Texas at Austin; and Nautilus at the National Institute of Computational Sciences (NICS) at the University of Tennessee. Resolving the timing and phylogenetic relationships of birds is important not only for comparative genomics, but can also inform about human traits and diseases, according to the researchers. For example, the study included vocal-learning species - such as parrots and hummingbirds - which can serve as models for spoken language in humans and may prove useful for insights into speech disorders. Well, not really - or at least not all, as the first birds emerged together - or even before - the dinosaurs. The problem is actually not so difficult - if they flying would bring an evolutionary advantage for some reptiles, the the birds would already exist together with walking dinosaurs from the very beginning of their evolution. If some cataclysm wiped out the terrapods, then it wouldn't be sensible to assume, that the ability of flying developed during it. A more probable scenario is, the birds existed together with dinosaurs and they survived the catastrophe instead of them. The main source of this confusion is, the bird fossils weren't found in large quantities with compare to dinosaurs, but it could be explained easily. The body construction of flyers is lightweight, with hollow bones, so that it doesn't survive the fossilization. And once some cadaver of bird appeared at the ground, it was immediately eaten with dinosaurs, who were scavengers often. So that the fossils of birds are systematically missing in our records. Then why does every site that I look up Birds (Aves) say that all birds are Theropod Dinosaurs? "Excerpt: "Can one tell whether it was pro-cell or bio-molecules that emerged first? It seems that all these structures could have emerged simultaneously. What emerged was dark matter and its emergence involved the emergence of all the others. Hens and eggs emerged simultaneously." Because the contemporary science has been separated from reality? Second off, you may ignore Captain Stumpy safely - he even doesn't remember the articles, discussed here before one week. He can only manage the clicking to asterisk button. you still promoting that falsified debunked religious aw/daw & cf stupidity? Apparently every "modern assumption" of science can be disproved with some even more modern one...;-) Try to remember it for future. secondly: what part of protein sequencing vs skeletal interpretations did you misunderstand? more importantly: THIS IS THE SCIENTIFIC METHOD, you moron! At first, every article at specialized section of PhysOrg is based on some scientific study. At second, the contemporary version of "scientific method" has lead into ignorance of cold fusion or aether model for one century. Please, let the historians judge, what the correct scientific method actually is. But I can assure you, the censoring and downvoting posts at personal basis definitely isn't scientific method. And it will never be. You're a parody of scientific thinking and acting at public. Or even worse - the people like you are doing a public disservice the scientific community as a whole. And these tests of standard biology or standard physics re his pet ideas are explicitly not 'ignoring' them but showing them ever more wrong. Either they make different claims, that contradicts the evidence. Or they don't make quantitative claims at all, so are inept. There have been 100s if years of not ignoring, but considering and rejection. Honestly, this troll makes the web go ZZZzzz... Stupid behavior (the person may not be stupid, but that idea is also long tested with seeming fail ...) is boring fast. A more probable scenario is, the birds existed together with dinosaurs and they survived the catastrophe instead of them. One argument I can make for this, is why would nature let the vast ecosystem, now occupied by birds, go unexploited back then. There are another even more stranger indicia. For example, today it's believed, most of terrapod dinosaurs had a feathers on their body. But for what, if they coudln't fly? The feathers aren't simpler than fur - they're much more complex and adapted to gliding in air.. Captain Stumpy is right, that the body construction of most of terrapod dinosaurs resembled the existing birds closely. OK, but why - if these terrapods couldn't fly? And why the dinosaurs - so different from another reptiles - emerged at the Earth after all? Apparently, we missed something here..
no, the lack of repeatable experimentation and the studies which falsify as well as prove one impossible are what is keeping your precious CF and aw/daw philosophy from being "mainstream"
you are downvoted because you promote pseudoscience and display ignorance as well as the fact that you are unable to accept the evidence which refutes your choice of religious faith: aw/daw - it has nothing to do with "personal feeling"